This blog started out as primarily a hunting, outdoors, and survival/preparedness-oriented blog, but I seem to find more articles to write concerning firearms and gun ownership than anything else at the moment. Perhaps that’s because it is a subject that is near and dear to my heart. Regardless, I want to take the time to address “sportsmen” and hunters who disclaim the natural and inalienable right to keep and bear arms. Though I’m an advocate of concealed carry and self-defnese, I’m going to address this from the perspective of a hunter. Fellow blogger Weerd took to task a self-proclaimed hunter and writer, whose article I will not link to here, over his claims that the “NRA Extremists” do not represent him. These “Fudds” (as in Elmer Fudd), as they are referred to by those who champion 2nd Amendment rights, claim that it does no harm to restrict or even ban ownership of handguns, standard capacity semi-automatic rifles, or other firearms with “scary” features such as folding stocks, flash suppressors, or muzzle brakes. Such claims could not be further from the truth. Laugh if you want, but this “tactical” shotgun can easily do double-duty as both a home-defense firearm as well as an effective dove gun by simply inserting a magazine tube plug. First, let’s take a look at the current tax scheme that weds hunters and 2nd Amendment supporters together. Ammunition sold in the United States is subject to a federal excise tax. Every round that is sold is taxed, and that revenue goes directly into the Wildlife Restoration Trust Fund, also referred to as the Pittman-Robertson Trust Fund. Every year over 700 million dollars are sent to this fund, and that money goes directly to establishing, restoring, and preserving huntable wildlife habitats. As a hunter, you may think that you are the primary source of revenue for this fund. Based off of just the number of shot shells expended chasing dove last season, it’s easy to see why someone might think that way. But if you’re a hunter who does no range shooting other than to sight in a rifle and fire some #8 shot at a few clays, the amount of ammo you expend is FAR less than what a shooting enthusiast might go through in a given year. I don’t know a single person with hunting as their only firearm-related activity who will go through more than a couple of hundred rounds a year. On the other hand, an active IDPA or USPSA shooter can easily run through tens of thousands of rounds in a season, all of which are taxed as “hunting equipement”. In fact, every firearm and firearm-related accessory, whether intended for hunting or self-defense, is subject to this same Federal excise tax. Who’s supporting the wildlife now? There’s nothing quite like the grin on the face of a new hunter who’s just bagged their first quarry. Second, let’s address the claims that restrictions upon the types of firearms that are legal for an individual to own will not impact or hamper hunters. For hundreds of years, soldiers and warriors who went off to war brought back with them a fondness for the rifle that kept them alive throughout the conflict. Whether it was the Brown Bess musket of the American Revolution, the 1903 Springfield, M1 Garand, M14/M1A, or even the M16/AR-15, after the war the soldiers who returned often sought out similar, if not identical, rifles for hunting and shooting at home. And why not? The rifles proved themselves accurate and supremely reliable under combat conditions, and that same accuracy and reliability would continue to be useful in bringing home a little venison every fall. These and other excuses make up the bulwark of the Fudd’s reasoning for further violations of our natural rights guaranteed by the 2nd Amendment, but when you break down and examine each excuse, they fall flat. Nobody needs that much firepower? A .300 Win Mag has more than twice the energy of a standard issue 5.56 NATO round, and .308 hunting rifles are virtually identical in form and function to a 7.62 NATO “sniper” rifle. Only good for spray and pray? Modern military training with the M16 discourages automatic fire, and in fact many rifles issued to our troops these days are only equipped with a 3-round burst. Instead, soldiers are trained to use deliberate-aimed fire for maximum effectiveness, much as hunters use carefully aimed shots to quickly down their prey. Hunting rifles aren’t designed for killing people? Au contraire, every black powder, bolt action, and semi-auto hunting rifle on the market today was derived from, or is a direct copy of, a military rifle design. Every. Single. One. Firearms were first developed as a weapon of war and a means of self-defense. It was only later that their usefulness in pursuing game was realized. Ancient cannons, muskets, and handgonnes begat modern punt guns and shotguns, while nearly every modern bolt-action rifle is based in part off of the Mauser brother’s 1871 design. And what about handguns? I’m using a handgun as my primary hunting weapon this year. It presents an interesting challenge and forces me to hone my skills stalking close to my prey, and it’s much lighter and easier to tote around the woods than a long gun. If there were restrictions on handgun ownership, I might not have that option. At the end of the day, it all comes down to basic human rights. Everyone has the right to self-defense, and I believe hunters have the right to provide food for the table. 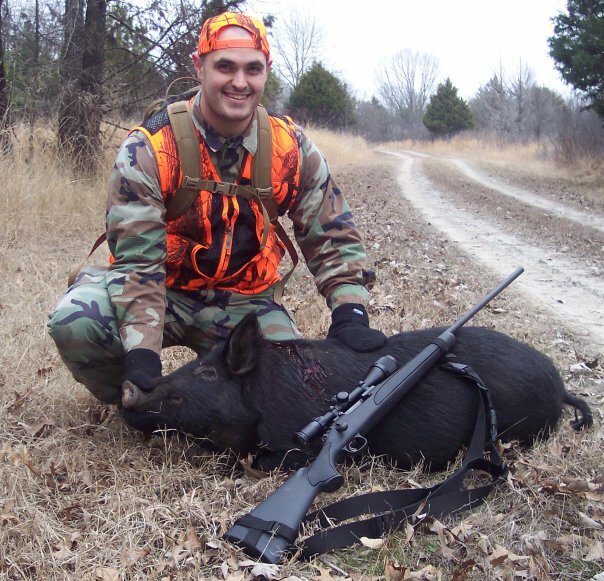 Hunters also have the right to restrict themselves to muzzleloaders, shotguns with slugs, single shot centerfire rifles, or modern bolt actions. Or, they can utilize the latest magazine fed AR-based semi-automatic rifle (where hunting laws allow it). I will not pass judgement on someone who uses a modern sporting rifle in pursuit of deer. We have enough problems trying to grow the sport. Instead, we should be encouraging firearm ownership of all sorts and helping those who have the interest in hunting to learn the ways of the woods, to learn the ethics of hunting, and to learn the skills it takes to bring a meal from hoof to table. At the end of the day, we’re all in this together, seeking to protect the rights that are valuable to us. I will end with this offer: If you are a hunter in the North Texas area, and want to learn how to carry and shoot a handgun for self defense, contact me and I will take you to the range at my expense and safely teach you the basics of pistol safety and concealed carry. Likewise, if you are a shooter or CHL holder in the North Texas area, and want to learn how to hunt safely and effectively, contact me and I will help you pass a Hunter’s Safety Education course, help you get a hunting license, and then take you out on a dove, deer, hog, or squirrel hunt (your choice). UPDATE: Via Thirdpower we find that Weer’d has learned a bit more about this particular Fudd. Have you seen the update about Cieslewicz yet? Yeah, I saw that. He’s not doing anyone any favors. I’d still love to have you hunting out at our place sometime.